This paper deals with the word- ' ayas ' used in the Hindu Scriptures. Many Indologists have concluded that it does not mean iron. They believed that iron found its way into India through the Aryan migration after 11th Century BC . Therefore, they concluded that Vedas and other Scriptures could be as recent as 11th Century BC. Furthermore, many think that the description about iron mentioned in the Mahabharata has been added around 2nd Century BC because it did not exist at the time of the Mahabharata War. 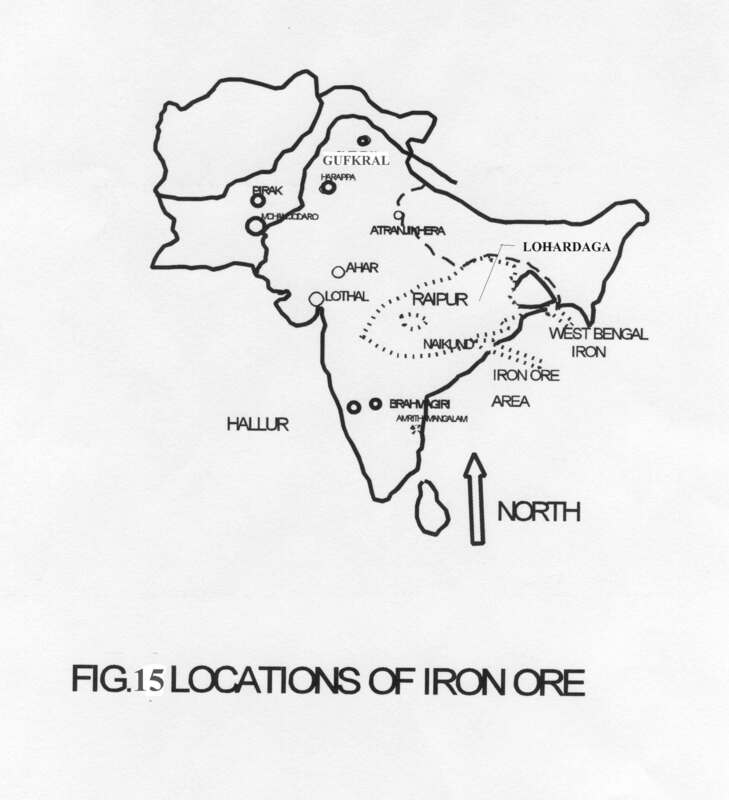 This paper contradicts these views and shows that iron was present in the Indian Sub-continent since 2000 BC, and that the Scriptures could date back to the times of the Harappan Civilization. The meaning of the Sanskrit word > ayas > has been debated for a long time. Many have believed that iron did not exist during the Vedic Period, so >ayas > means non ferrous alloys ( bronze, brass etc ). 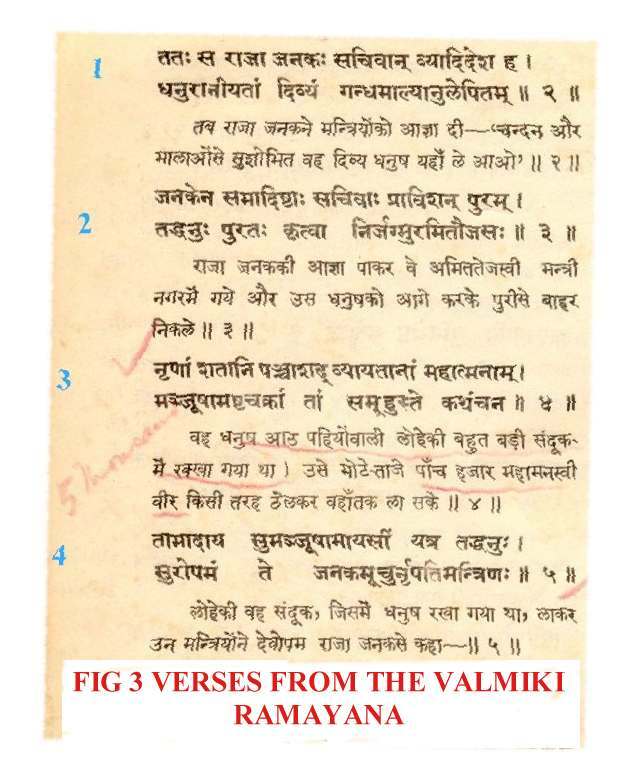 So far, there was no evidence to prove that iron was known to the sages like Vyas, Valmiki etc. It was also believed that iron was brought by the so called Aryans into India, and the plains ( Ganga - Yamuna ) were inhabited after the cutting off of the forests in the swamps by iron tools. Before this era, the population of the India was first settled along the Indus River, and then along the India - Nepal border. Are such beliefs true ? The answer, according to the author is - no. We can see this by examining the evidences presented here. shows the Bow in a eight - wheeled box. It was wheeled to the place of contest by the ministers of King Janaka. Not only this, it is well known that Dhritrashtra embraced a dummy made of iron , instead of Bhima, after the Mahabharata War . Bhima=s mace was made of iron . Similarly there are clear descriptions of iron in the Mahabharata at many places. Many say that these descriptions were written or included many centuries after the Mahabharata War, if that War ever took place. The word > ayas > has been mentioned in the Vedas many times. The Rig Veda was composed close to the Harappan Civilization. Could some one have known about iron in those days ? How old are the Vedas ? The early Rig-Veda mentions about the Asuras who were described to be nice people in the beginning . 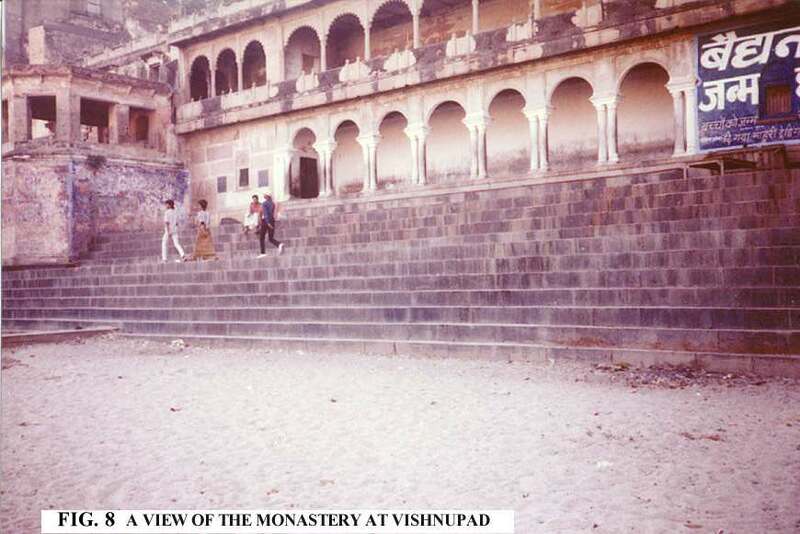 show pictures of Vishnupad at Gaya , a place where the Hindus go to offer water to their fore-fathers . In Fig. 6, one can see Lord Vishnu killing Gayasura which can be written as Gaya - asura. Fig. 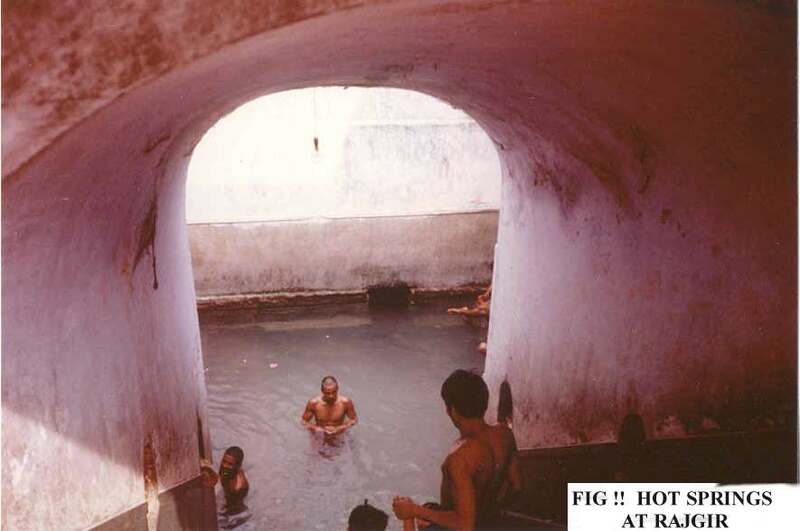 7 shows the Phalgu ( Niranjana ) river where the water is offered, and Fig. 8, the monastery at that location. Adi Shankaracharya had visited here during his travels around India. The temple at this place is shown in Fig. 9. The Asuras had lived in India even during the Vedic days. The fact that the Asura, Banasura was invited to Sitajee=s swamvar ( an occasion when the princess selected her own partner ) shows that the so called Aryans ( King Janaka ) got along well with the Asuras. 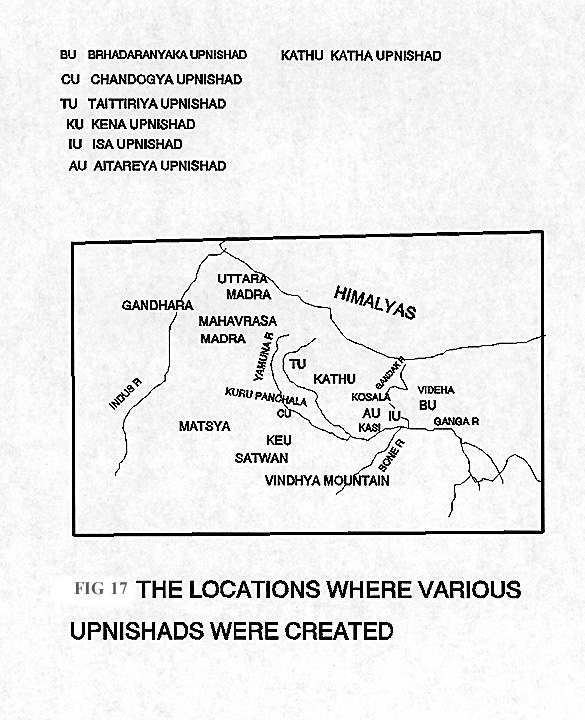 Furthermore, the presence of Ravana, and Banasura ( lived near Arrah - shown in Fig. 4 ) indicates that people traveled far and wide even during those days. Bhima in the Mahabharata had killed the King of Magadha - Jarasandha at Rajgir ( Fig. 4 ), and Bakaasura , near Arrah. Rajgir was the first capital of India during its written history. Here, Lord Buddha had converted King Bimbisar on the Vulture Peak. A few scenes of Rajgir are shown in Figs. 10 to 12 .
. In Figs. 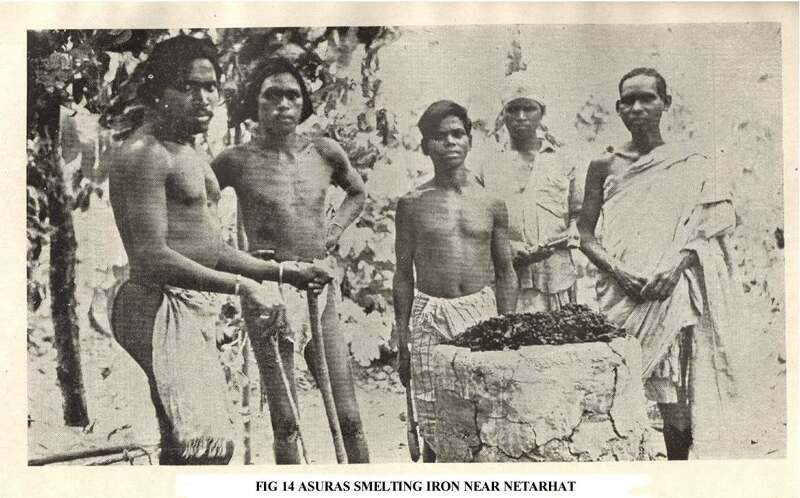 13, and 14, the Asuras are shown smelting iron near Netarhat ( refer to Fig. 4 ) . This picture was taken during the sixtees of the last century [ Possehl,. and Gullapalli, 1999 ] . These Asuras are known to smelt iron in large numbers in the nineteenth century, and before. ( 3 ) Karnataka and Tamilnadu areas where one can see places like Paiyampalli ( again Neolithic- Megalithic ),which is in the Arcot district of Tamilnadu, where iron was smelted . 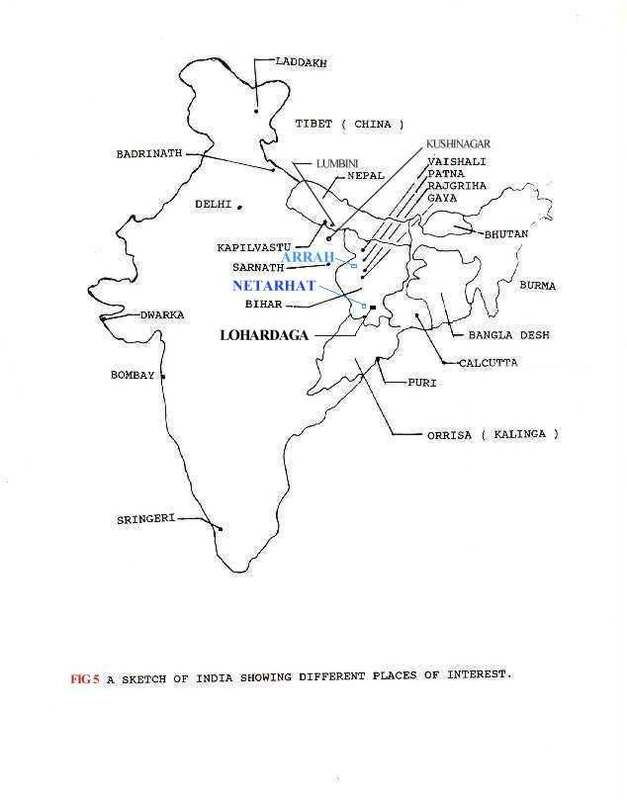 It is believed that the expansion of the Magadha Empire was due to the source of iron nearby ( Baraaber Hills near Gaya - refer to Fig. 4 [ Wolpert ,1993]). The Asuras of Netarhat belong to the group of the tribals of Central India where to-day , most of the Steel Plants ( roughly 90 % and above of steel production of India ) takes place. The Steel Plants are located at Bhilai near Raipur, Rourkela in Orrisa, Jamshedpur, Bokaro, and Burnpur. 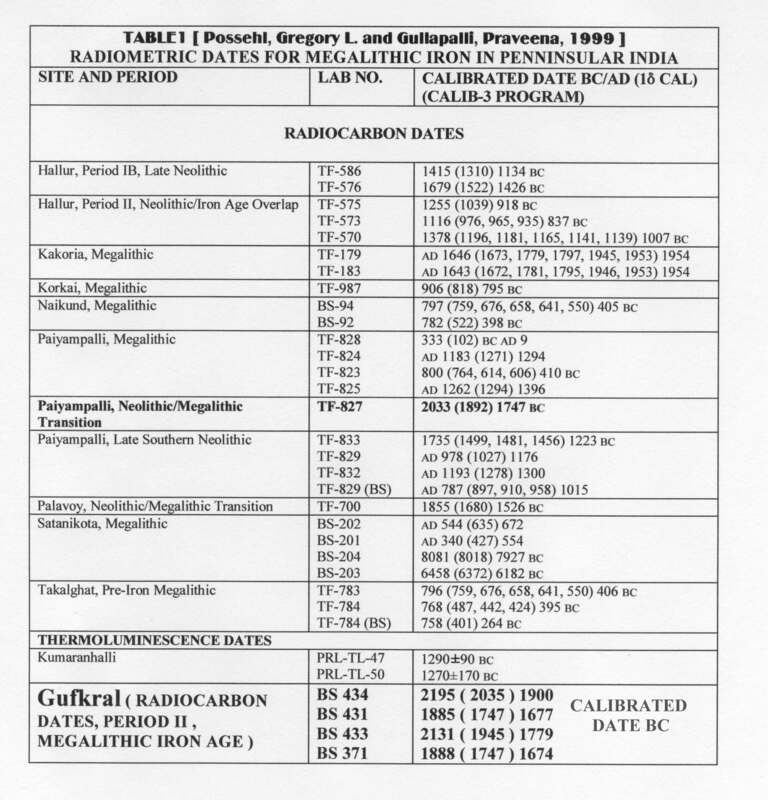 The ore for the plant at Durgapur ( West Bengal ) possibly is also obtained from this area only . In can be reasonably be sure that iron technology within India was developed independent of those from outside, and that the Aryans did not bring this technology into India. One can further read other relevant and interesting literature such as those by Joshi [1998 ] , and Fitzgerald [ 2000 ] mentioned in the references below. They discuss the superb quality of ancient steel produced in the ancient times which includes the Mahabharata. the Vedas, the Ramayana, and the Upnishads , took place on the plains of India, which are , as the author understands , the biggest plains in the world ; and Fig. 18 shows that people including the sages , traveled from the North to South India in those times. Therefore, the development of steel or iron was not limited to one particular area. Right from Kashmir to the South India, the technology was constantly transferred. Finally, the word > ayas > included iron when mentioned in the Scriptures. 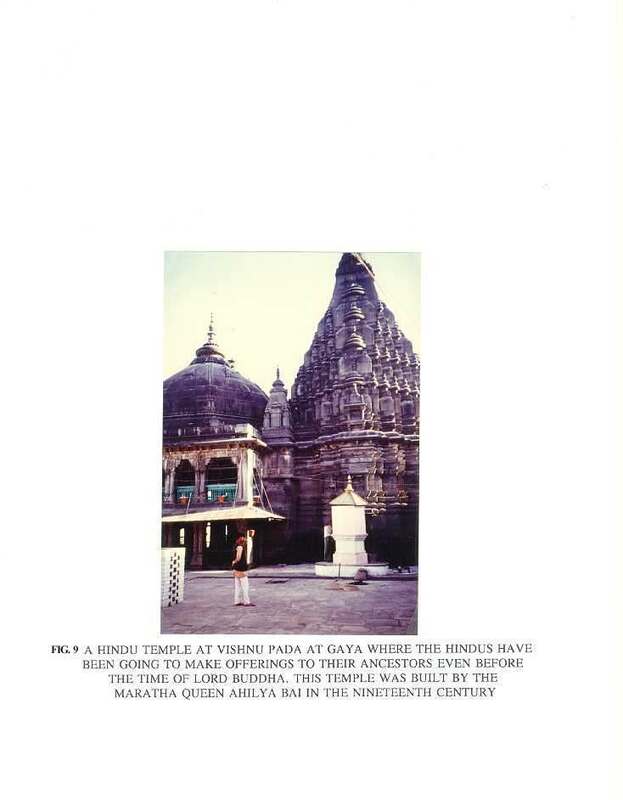 Biswas, A.K., 1996" Minerals and Metals in India", D.K. Print World Ltd., Shree Kunj , F-52 Bali Nagar, New Delhi-15. James A. Fitzgerald , 2000 -Journal of the American Oriental Society, 120.1 Jan-March ; pp 44-61. Kosambi, D. D., 1965, A The Culture and Civilization of Ancient India A, Routledge and Kegan Paul, London, U.K.
Possehl, Gregory L. and Gullapalli, Praveena, 1999 ,@ The Early Iron Age in South Asia A , In Pigott, Vincent, editor, The Archaeometallurgy of the Asian Old World. University Museum Monograph 89, MASCA Research Papers in Science and Archaeology Volume 16 , Philadelphia:The University Museum, University of Pennsylvania, pp. 153-175. Wolpert, S. , 1993 , A A New History of India A , Oxford University Press, New York, Fourth Edition .